Irrelevant labor—the concept seems impossible. After all, in the natural world, we observe two things about work. First, since it is necessary to survive, work must always be done (even the dullest coyotes must still catch rabbits). Secondly, work is something to be minimized subject to attaining a desired goal. Labor or work is a necessary evil. In fact, the entire progress of human civilization and science seems to be based upon making our efforts more efficient—that is, so more can be attained with less work. Advances in our standard of living demand advances in productive laziness. That is, using our human ingenuity and intellect to produce more with less work. This probably began with the first caveman who started or captured a fire. Within the context of an economic “production function”, we think of capital, labor, and perhaps natural resources being combined in some production technique to produce a desired output. In such a setting what we think of as a useful technological advance is simply anything that allows a given input of human time and effort to result in more output—hence technology augments labor making the impact or effect of a given amount of labor greater. In this way technology increases the effective labor force—through more or better tools and/or more knowledge. Progress of humanity allows us to achieve a higher standard of living with less effort—even though we sometimes venture down useless cul-de-sacs of excessive bureaucracy or narcissistic technologies whose application seems to consume rather than to save time and effort. In a free-market, all labor can find some place in the perfectly competitive market, no matter how modest its marginal product may be—so long as the wage it receives does not exceed its marginal product. This is all true and yet we also know that as technological advance occurs some occupations of labor are more vulnerable to obsolescence and technological substitution than others. Returning to our rabbit-hunting coyotes for example, suppose coyotes suddenly somehow developed guns. Then this technological advance would appear to make the labor of those coyotes who didn’t have them, or know how to use them, irrelevant. Yet even coyotes who didn’t have guns could still harvest rabbits less efficiently for their own subsistence using their old production technique of chasing and catching. I am going to suggest three simple characteristics that I think capture the likelihood of technological substitution for a particular task or type of “work”—think of a particular type of occupation. These are not the only attributes that could be used, but I think they are useful in illuminating the risk of substitution of capital or technology for your job. Let us measure different occupations by the following characteristics: complexity, creativity and price. By “complexity” I mean the detail, routine, or the number of steps that must be mastered to accomplish a particular job. By “creativity” I mean the degree to which judgment, insight, unique problem-solving, decision-making, original intellect and/or imagination is required to practice a particular occupation. “Price” simply means the current cost to the market which employs the occupation—the total wage or total compensation. In the tradition of graphical economics, we could draw three axes in these variables with each attribute increasing as we move away from the origin—but don’t worry, even people as infatuated with graphs as economists find it difficult to draw three dimensional graphs. Instead, just think of the ordered triple of values (creativity, complexity, price) associated with different occupations and then let us consider some specific jobs. Of course these attributes are not necessarily independent of each other and they are somewhat subjective as they relate to different occupations. In addition, they may vary for a given occupation in how different individuals perform their work. You will already have inferred that this is important in a competitive marketplace. It is for the market to sort this out, not for our subjective conclusions or opinions. The best and simplest way to illustrate this framework is with some examples. If there is a theme in our world of increasing ease of access to information, it is that the jobs that have survived based upon simple mastery of complexity, alone, are probably the most vulnerable to technological substitution. Put simply, practitioners of them are likely to be at risk of replacement by a machine or an algorithm. A subsidiary theme is that when governments, bureaucracies, or even private institutions (unions) enter the fray in order to “protect” such jobs with either good or bad intentions (given the byzantine agendas of politics, we’re not sure which)—they ironically often end up eliminating or destroying them. Start with the most famous example that most of us are already familiar with. Consider assembly-line manufacturing, such as workers in an auto plant, circa 1970. In most cases, such jobs involved tedious, repetitive tasks. These individuals are doing what humans do rather poorly and should not have to do, mimic robots. Their job is routine, sometimes complex depending upon how many separate tasks they must master, and boring. 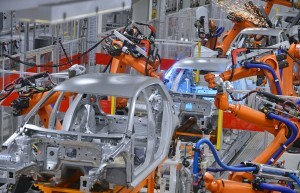 Assembly-line workers do not interact with the final consumer of the automobile and are personally unknown to them. In terms of our three attributes, complexity could be low to high, creativity is intentionally very low and, if it should happen, is not appreciated or rewarded, and due to efforts of politicians or the UAW, the price may be viewed by their employers as quite high. The outcome is by now an old story in U.S. manufacturing and has led to the replacement of most repetitive assembly-line jobs being replaced by robots or capital-intensive production techniques. In the limiting case, the only employees needed on an assembly line are production engineers, and perhaps software engineers—in order to make sure the machines are working properly. This revolution in the U.S. economy is reflected in the steady decline in manufacturing employment in the U.S. economy. It fell by 50% from 1970 to 2012. This caused the U.S. to be viewed as an economy in which manufacturing is dead, and de-industrialization rampant—with manufacturing and jobs apparently fleeing overseas to other economies that can exploit cheap labor, notably China. Despite articles to the contrary, this perception is categorically not true, as growth in U.S. manufacturing output has kept pace with the growth rate of overall U.S. GDP. U.S. manufacturing is healthy, semi-skilled manufacturing employment is not. Machines really have replaced labor in assembly-line manufacturing and thank goodness. Who wants these repetitive, tedious, low-paying jobs anyway? As a recent related example, we are all familiar with using computers to print files as physical documents. A new technology referred to as “3-D printing” allows computer design files to be printed not as documents but as actual final products or “stuff” with no intermediate steps. You want a pair of shoes customized to your feet and tastes? Print them! Where do you print stuff? That depends on minimizing raw material and shipping costs, but in many cases it will pay to print or make final products physically closer to the final consumer. There is potential bad news here for emerging underdeveloped countries and perhaps for the global shipping industry. In the past, underdeveloped economies have typically expected to earn their seat at the world economic table by offering a large pool of unskilled or low-skilled labor available for extremely low wages. As the cost of substituting capital for labor diminishes and capital-intensive production grows yet more efficient, the wage at which it is not worth replacing these folks with capital in manufacturing could be very low indeed—in fact lower than that required for their subsistence. Thus, finding a place in manufacturing or assembly for very low skilled workers is, for them, a dreary prospect. Moreover, as technology continues to advance, it is becoming drearier. All this, of course, is not a new problem. Read the 19th century legend of “John Henry,” for example. Who wants these machine jobs? Who wants to be a “steel-driving man” anyway! Aim the efforts of your low-skilled, but would be upwardly mobile work force in a new and different direction—one in which human interaction and human skills are desired and preferred by consumers. Aim them at becoming barristas or leaders of “hot yoga” classes. Have them become professional athletes or cage-fighters! Speaking of that, let’s turn to the case of the cage-fighter. Now subjectivity creeps in, as it always does in the free marketplace. Some of us (including me), may say this occupation perplexes them by its very existence. In our (my) subjective view, creativity is low (individuals bash each other in the head until one of them succumbs), complexity is low (individuals bash each other in the head until…) but the market price is absurdly high because morons are always attracted to such blood sport spectacles (see, for example, the movie, Idiocracy). This kind of sneering at someone else’s preferred consumption choices is oddly common, even in societies that value freedom and free markets. To those who do value freedom, such diversity of tastes and preferences is the beauty of the free and continuously emerging marketplace. Many things are made and consumed that you would not. The many who enjoy and are aficionados of cage fights hold a different view and would come out with very a different ranking: 1. Creativity— extremely high, perhaps off the scale, because cage-fighters must make rapid decisions using all of their mental and physical skills with partial information. Moreover, they accomplish this under uncertainty and faced with the direst of consequences. 2. Complexity-low you just need to be a good fast basher. 3. Price-high because people with the courage, ability, intuition, other mental attributes, and physical attributes required to prevail at this raw form of entertainment are very rare. You could, of course, replace cage-fighters with machines, but what would be the point? Their “humanness” is what their audiences identify with and are entertained by. Despite disparaging contrary opinions, cage-fighters, at least currently, win the argument with those, like me, who disparage them or their sport. Whether we like it or not, the free market rewards them handsomely. In fact, having rare physical or mental human skills and being fun to watch probably explains the employment and compensation of most athletes and celebrities. This also raises an interesting and very optimistic point for the larger labor market. Humans typically like to personally interact with other humans in the provision of many services—unless those other humans have little in their personality or people skills to differentiate them from say a codfish or a wolverine. Hence, the familiar case of the Stanford graduate (we all know one) who has a degree in, say, communications, sociology, or political science, but who has become a barrista. For barristas, complexity is low, price is also typically low, but creativity is apparently quite high. Creativity in this case is reflected in the artistic flower patterns drawn on the top of our mochas, the lending of a sympathetic ear to customers, and the stimulating humor and conversation. This person may seem to be sadly underemployed. But don’t worry. With their imagination, general background, intelligence, and people skills, they will soon likely re-invent themselves as a major marketing force—perhaps becoming the CEO of the largest new “hot yoga” franchise in the region. 1. Calories in = Calories out is the necessary condition to maintain one’s current weight. If calories in > calories out, then fat will accumulate. If calories in < calories out, then fat and weight will decline. This advice may seem rather stark and heartless to most of us. Being social, many humans tend to enjoy pursuing “self-improvement”activities in groups and/or with gurus, coaches and cheerleaders. We also love novelty and the idea that we have somehow missed a less painful alternative. “You mean I can eat all the cookies I want as long as I don’t eat anything else? Sign me up!” “Let me get this straight, are you telling me that Oprah’s latest diet attempt is just celery and pudding? I’ve got to try that!” Thus, in the employment of savants in the diet service industry, creativity is high by demand, complexity is low, and price is fairly high depending, of course, on the creativity and appeal of the marketing effort. By now you will have gotten the idea that the occupations that are the most vulnerable are likely those in which complexity is high, creativity is low (decision-making, unique problem modeling and solving, imagination and the exercise of individual experience and insight are low) and perhaps by chance, inertia, or oversight the market price still remains high. This sounds suspiciously like the market for “stuffed-shirt” experts or formulaic practitioners in all fields—the advisors in many cases who have gotten a job out of making our own lives either less complex or, ironically, more complex and effectively made a niche for themselves “between the wallpaper and the wall.” In an “ask-Google” or “Wikipedia” world, the need for and admiration of “Trivial-Pursuit” experts is endangered and shrinking. At risk are many professionals who have found their niche by mastery of a body of arcane detail and going “by the book.” This includes, for example, many lawyers, doctors, pharmacists, engineers, desk clerks, agents, bureaucrats, accountants, bankers, brokers, professors, and investment advisors. It is useful to remember that where human contact is direct, enjoyable, and preferred by the market, jobs can often do well, even in competing against software substitutes that already exist. Take, for example, the much maligned and under-appreciated travel agent. Long ago, this occupation was widely expected to disappear with the preponderance of travel bargain websites, with the availability of do-it-yourself trip planners and direct ticketing. Travel agent employment has certainly shrunk. That it still exists at all is testimony to the fact that there is still a market for individuals who remove the tedium of planning and booking your own trip, and who can offer personal service and imaginative suggestions and an attractive personality to those who don’t like to negotiate countless websites. In surveying the landscape of technological substitution, it is worth remembering that there are many things we could do for ourselves, but prefer not to.